WWE 205 Live Recap - Nese vs. Alexander; Mike & Maria Kanellis Debut! It's time for another episode of 205 Live on the WWE Network! After WWE Super Show-Down this past Saturday, has Cedric Alexander proved that he still belongs as champion? Did Buddy Murphy dethrone the champion in his hometown of Melbourne, Australia? What's the future for the Cruiserweight Championship? Also, who will answer Lio Rush's open challenge? Tune in for all the answers. Hit F5 to refresh the live recap! After the WWE went down under to Melbourne, Australia, the hometown boy Buddy Murphy returns to the U.S. as the NEW WWE Cruiserweight Champion (as evidenced by the video package from WWE Super Show-Down). Buddy Murphy and Cedric Alexander had an incredible match, and the crowd was hot for it, including when the ref's hand hit the 3-count. Cue the opening! The commentators talk about the aftermatch, and they preview the main event of Alexander taking on Tony Nese. But first, as teased, Lio Rush comes out to the ring dressed to compete as he has issued an open challenge for tonight. Lio Rush: "Do you hear that? Do you hear the ticking? That means that it's the Man of the Hour's time. That means that it is Rush hour, and being the Man of the Hour, that means that any moment every minute, every moment is time to make someone famous. And that's why the Man of the Hour is here in Indianapolis, I'm here to make someone famous tonight. Haha. Now listen, I know that you guys are used to those fast cars going around that fast track, but you better believe that there is nobody or nothing better than or faster than the 23-year-old piece of gold Lio Rush. So listen, we're gonna do something different tonight. I'm going to give a lucky individual an opportunity of a lifetime to prove the Man of the Hour wrong. SO, who's it gonna be? Whoever it is, you better come correct, cause Man of the Hour came to collect." LUCHA LUCHA LUCHA! Rush asks about the Lucha Lucha chant, Dorado shows him how it's done, they wrestle a bit trading holds and countering out, Dorado with an armdrag, Rush with an armdrag, both try for one and block, both try for a dropkick and miss, both flip to their feet and have a stalemate. Rush kicks him, clubs him on the back, Dorado reverses an Irish whip, leapfrog, Rush slides under him, Dorado with a headscissors takedown, dropkick, delivers a tilt-a-whirl backbreaker, falling splash, and Rush kicks out at 1-count. Dorado stays on offense with punches, gets tossed onto the apron, slams Rush's face on the top turnbuckle, Rush does a handspring kick to knock him off the ropes and hits a suicide dive through the bottom ropes. Rush stomps on him on the floor, throws him into the barricade as the referee continues his count up to 7, Rush throws him back into the ring, covers for 2, beats him down, chest rake, back rake, belly-to-back suplex, covers for 2, then puts him in a rear bearhug. Dorado fights back, Rush hits quick combo strikes, mocks him, Dorado hits him, Rush hits a hard forearm, goes for the mask, Dorado fights him off, punches him, Rush with a running dropkick to the stomach, Dorado clotheslines him, hits a spinning heel kick, slap to the chest, rolling kick to the head, and swinging mat slam. Dorado hops up onto the ropes, kicks him away, Rush grabs his ankle, Dorado fights him off, hits a high crossbody but only gets a 2-count. MARIA KANELLIS COMES OUT TO THE STAGE, AND HER HUSBAND MIKE KANELLIS ATTACKS DORADO FROM BEHIND and knocks him off the top rope!! WINNER by DQ: LINCE DORADO. Mike Kanellis pummels Dorado in the face as Maria heads towards the ring. Mike hits a twisting DDT while Maria smiles her approval. Mike and Maria Kanellis celebrate their love in the ring after that post-match attack. The commentators are just as confused and speechless as everyone in the crowd. It's time we get our first comments from the new champion, Buddy Murphy. He gloats that "you can't stop the unstoppable" and proved to everyone that he would be the next new Cruiserweight Champion. He says that he won't be on 205 Live tonight because he decided to spend extra days in Melbourne, and since he's the new champ he chooses to do what he wants when he wants. "I'll come back to 205 when I'M ready." 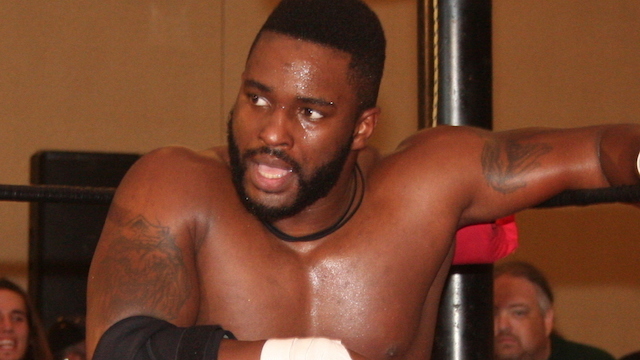 Cedric Alexander is mentally preparing himself in the locker room. Mustafa Ali checks on him, says he's got a match against Hideo Itami in two weeks, and it'll be a Falls Count Anywhere Match. Alexander wishes him luck and sits back down, Ali asks him if his match against Tony Nese tonight is too soon, and tries to convince him that it's not a wise decision. Cedric calms him down by telling him that all he has to do is go in the ring and show Nese and Murphy that he is good and means business. We go back to 205 Live last week where Drew Gulak and Jack Gallagher kicked The Brian Kendrick out of their stable by beating him down. In a backstage video, Gulak says it's tough when a group dissolves and addresses that's why they got rid of him. Gallagher adds it was necessary, even though Kendrick is a former champion. Gulak says Kendrick lost his killer instinct, and wishes he got rid of him before his championship match. Gulak: "Next week our cause continues when we finally remove yet another maddening thorn from our side and take out Akira Tozawa. Make no mistake, our message is clear and our constitutions are committed. No one will standin our way of creating a better 205 Live. Thank you." Gulak vs. Tozawa is NEXT WEEK on 205 Live. The bell dings, they circle around each other, and the crowd chants "Let's go Cedric!" They lock up, Alexander with a side headlock, pushed off but holds on, Nese pushes him off successfully, Alexander hits a shoulder block, runs the ropes, cartwheels over him, rolls under him, backflips into a headscissors, Nese blocks it and they have a stalemate. They lock up, Nese with a rear waistlock, Alexander reverses, Nese counters, Alexander goes for a pumphandle but Nese quickly counters to an armbar, Alexander counters out of it, Nese hits a back elbow, lands on his feet from a moonsault, drops down, kips up and does jumping jacks, then does his Premiere Athlete pose. Alexander dropkicks him out of frustration, slams his head on a turnbuckle, chops, European uppercut, stomps a mudhole in a corner, Nese gets a break by being in the ropes, Nese trips him, yanks him out the ring by a leg dropping him on the floor, and kicks him in the midsection at ringside. Nese throws him back in the ring, gets a 2-count, stomps on his midsection, then puts him back in the midsection. Alexander fights back with elbows, knee to the jaw, backflips into a headscissors takedown, Nese rolls out the ring, Alexander runs the ropes but Nese surprises him with a running lariat for a 2-count. This time Nese puts him in a body scissors with his legs, Alexander tries to fight back, Nese drops his neck on the top rope, goes for thr apringboard moonsault, but Alexander got the knees up. Alexander clotheslines him two times, hits an uppercut, whipped to a corner, dropkicks him in the knees, hops onto the apron and hits a running knee to the jaw, then follows up with a springboard flatliner. Nese tries to sneak attack him but this time Alexander connects with the backflip-into-headscissors move, clotheslines him out the ring then does a somersault plancha. Alexander connects with a springboard clothesline but only gets a near-fall. Nese rolls him up for 2, Alexander with a backslide for 2, counters and counters until Alexander quickly hits the Michinoke Driver for 2.9! Alexander can't believe he didn't put this match away. Nese tosses him onto the apron, blocks the springboard flatliner, backs him into a corner, Alexander kicks him, but Nese counters the springboard and drops him across the ropes, running knee, fireman's carry, gutbuster and gets another near-fall. Nese grabs him by the hair, calls him a loser and a fluke, Alexander with a forearm, Nese with an elbow, Alexander chops him, Nese kicks him, blocks a head kick, hits a running forearm, Alexander hits the Neuralizer and gets 2.9! Both men are down, Alexander stirs first, Nese slaps him on the chest, Alexander chops him, Nese sets him up for a pumphandle, Alexander avoids it and catches him with the STANDING SPANISH FLY for 2 as Nese gets his foot on the bottom rope! Alexander tries to figure out his next move, Nese pulls him out the ring, Nese with a legsweep and the back of Alexander's head hit the apron. Nese drags him into position, goes up top, leaps down with a stomp, Alexander moves out the way, goes for the Lumbar Check but Nese lands on his feet, Alexander slaps him, looks for the Lumbar Check again but Nese blocks it, Alexander argues with the referee so Nese CLOCKS him with a hard left hand! Nese hits the German suplex into the turnbuckles, connects with the RUNNING KNESE, goes up top and connects with a 450 SPLASH, covers and gets the 1-2-3!! WINNER: TONY NESE. What a finish! Nese was an unlikely candidate to win the match, as Vic Joseph calls this the biggest win for Nese's career. We get the replays and see just what happened. Nese shows off his muscles, Alexander shows he's visibly upset, and this show is over. That's all for 205 Live!